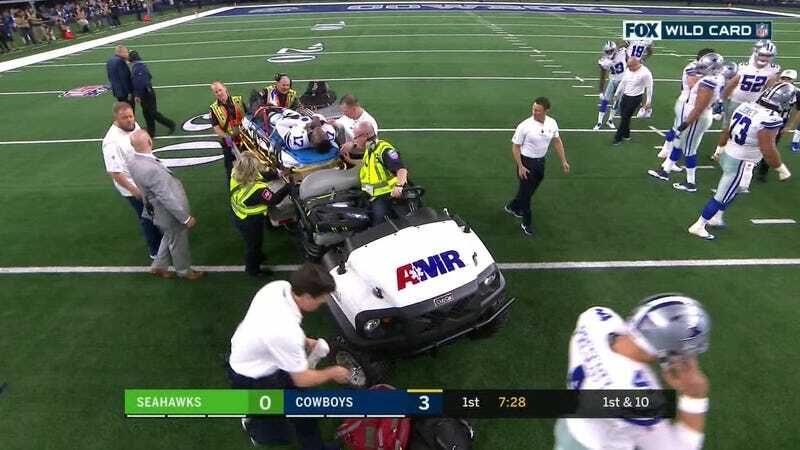 In the first quarter of tonight’s playoff game, Cowboys receiver Allen Hurns was tackled by Seahawks safety Bradley McDougald. As Hurns was fighting to stay upright, McDougald fell onto Hurns’s left leg and broke it. Once they realized what had happened, the players in the immediate vicinity of Hurns quickly turned around and tried not to look at it. Below are photos and a video of Hurns’s injury. As a warning, it is gross. The injury caused a lengthy delay, and Hurns eventually left the field on a stretcher. Getty photographer Tom Pennington caught Hurns writhing on the ground just after the injury occurred.